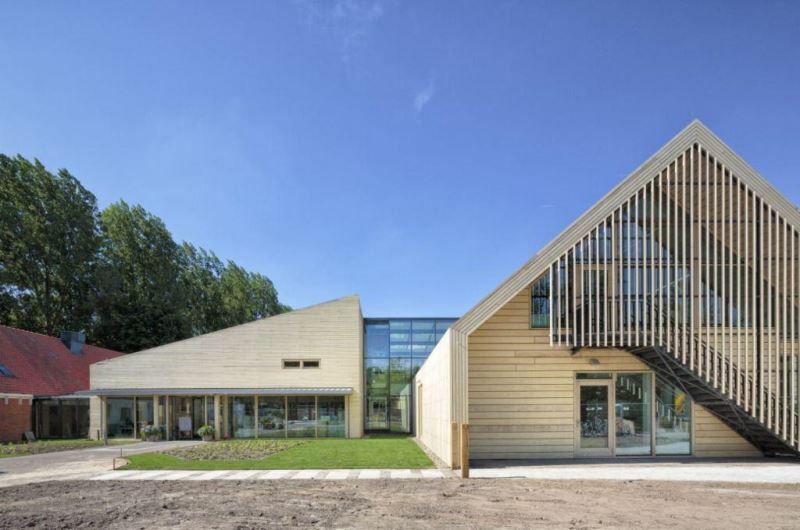 The American School of The Hague built an Early Childhood Center for 250 children aged 3-6 in Wassenaar. Kraaijvanger architectural practice designed a building that is not only sustainable, but also makes sustainability comprehensible to toddlers and young children. Wood is the key. A small 17th century farmhouse is included in the design. Around the farmhouse, 12 classrooms, one multifunctional space, a crèche, gym hall, lunchroom and offices have been built. By deepening the classrooms and aligning them diagonally from the axis of the building, the farmhouse does not disappear into the bulk of the complex. 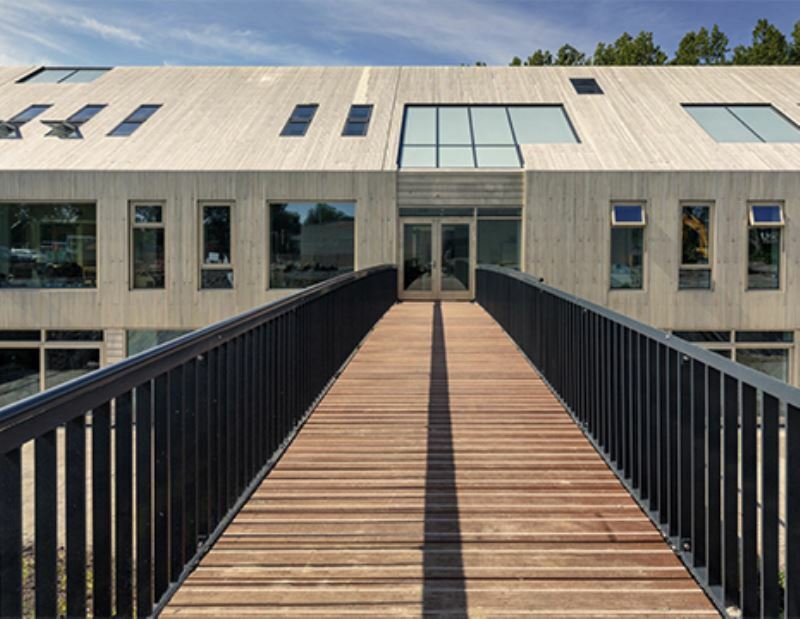 The school wanted a building that is both sustainable and radiates sustainability. This means among other things that solar panels and moss sedum are used on the roofs, alongside geothermal heating and LED lights. And there is also a special role allocated for timber. The playfully shaped new building's shell and the entrance and exterior frames were constructed of untreated Accoya wood. Accoya is FSC-certified and has the Cradle-to-Cradle Gold Standard. There are spruce columns, beams and roof trusses, and floors made of Lignatur. Bamboo parquet connects the floors via the staircases. In front of the entrance there is a terrace of Bagkirai. The furniture is made of wood and the walls of sheet material. In the old farmhouse, a floor partly made of larch wood has been laid. Historic wooden trusses have been restored, and the back of the farmhouse has a light bamboo parquet floor. The result is a fantastic experience of wood - the children can even smell it. 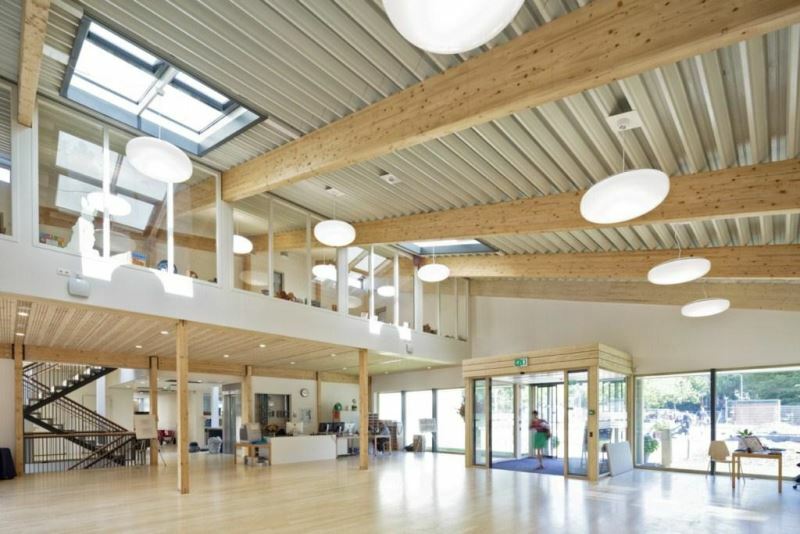 The school was nominated for the Timber Prize 2014. The jury judged that the Early Childhood Center showed magnificently how wood in many uses merged together and created a warm and secure atmosphere. ABT drew the design of the bearing structure, including the many wooden structures. The building is a gain for Dutch timber architecture.